Donington Nurseries act as agents for a reputable family-owned shed manufacturer and we offer a choice of well-constructed and attractive Summerhouses. There are a range of extra features available including verandahs, log lap cladding, window boxes, safety glass, toughened glass, heavy duty floorboards and framing. 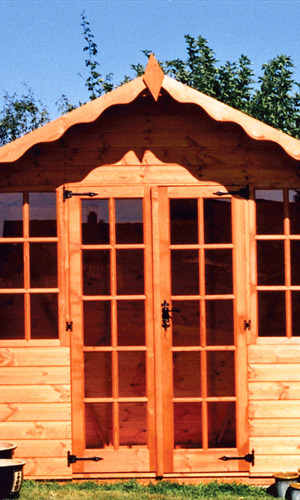 Various styles to choose from and a large range of sizes to suit all budgets and garden spaces. Our prices include vat, treatment, delivery and assembly in the Derby, Nottingham, and Leicester area. Brochures and prices available at the Nursery 01332 853004.